6 ft 2 in or 1.85 m.
85 Kg or 187 lbs. Clarence Alvin Daniel Gasby, popularly known as Dan Gasby is an American Businessman and Media Executive. He is famous as the husband of American former iconic model, author, television host, and restaurateur, Barbara Elaine Smith, popularly known as B. Smith. His wife, B. Smith has been battling with Alzheimer's since 2013 and Gasby has been caretaking her since then. However, Gasby has been making several headlines after he revealed that he is in a relationship with Alex Lerner earlier in December 2018, despite of being together with his ill wife. The 65-year old husband/caretaker of B. Smith has been dragged into criticism after his secret affairs with another woman surfaced. He revealed via a Facebook post in December last year that he is in a relationship with Alex Lerner, 53 despite being with his ill wife. His wife, B. Smith has been battling with Alzheimer's since its diagnose in 2013. Following the extra-marital affair revelation, he has become the subject of criticism to B. Smith fans. - He is the husband of B. Smith. Dan Gasby was born on 10 March 1954. His birth name is Clarence Alvin Daniel Gasby. He was born to a father, John Gasby, and a mother, Louise Gasby. He belongs to African-American ethnicity. His birth place is in Bedford-Stuyvesant, New York City, New York. He holds American nationality. His zodiac sign in Pisces. He follows the Christianity religion. He attended and graduated from Colgate University. Gasby began his career at a UHF TV station in Tennessee. He has also worked as an executive producer of CBS Essence Awards. Gasby was the vice president of marketing at Camelot Entertainment Sales Inc. He launched "Big Break", a reality show. He has founded and produced his wife's lifestyle show, "B. Smith With Style". He was also the publisher of his wife's self-titled magazine. Later, he became a business partner with his wife at her restaurant. 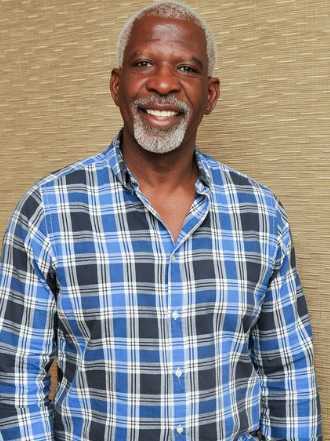 He has managed "B. Smith Enterprises Ltd."
Dan Gasby is a married man. He is married to American restaurateur, author, television host, and former iconic model, B. Smith. The two tied a knot to each other on 23 December 1992. Gasby has a daughter named Dana Carlisle Gasby from his previous wife. He currently lives with his family in Sag Harbor, New York. Previously, he has lived in Florida, Tennesse, and California. His wife, Smith revealed in 2014 that she was diagnosed with early-onset Alzheimer's disease. Dan Gasby stands at a height of 1.85 m i.e. 6 feet and 2 inches tall. He has a body weight of 187 lbs i.e. 85 kg. He has an average body build. His body measurements are 42-32-37 inches. He has a biceps size of 16 inches. He has dark brown eyes and white grown hair. He wears a shoe of size 12 (US). The net worth of Dan Gasby is estimated at around $1.4 million, as of 2019. He has worked as a media executive and is also a business partner with his wife. His mother was a homemaker. His father was a field-house manager at the Stevens Institute of Technology.